Not only the highpoint of my visit to the Salzburg Festival, this will surely prove a shoo-in for any list I might make of Performances of the Year. 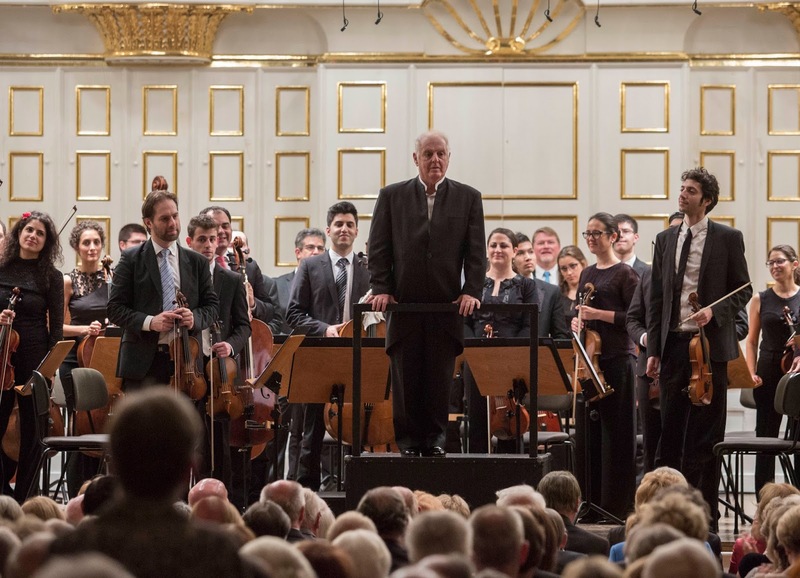 A couple of years ago, I heard Daniel Barenboim conduct the Vienna Philharmonic in Mozart’s final three symphonies; they were excellent performances, although just occasionally, I missed a little more of a smile. I do not exaggerate when I say that I found these performances with the West-Eastern Divan Orchestra superior in almost every respect, very occasional instances of raggedness only serving to remind that the players were human. Not that we really needed any such reminder, of course, for, imbued with the truest Mozartian spirit, each performance was brimming with humanity, with drama, with integrity, with the greatest of civilisation. These were, perhaps, the greatest ‘live’ performances of each of these three symphonies I have heard. The only rival coming readily to mind would have been a very, very different 39th from Thomas Zehetmair and the Northern Sinfonia. Moreover, without evident exertion to frame them as such, let alone sophistry, Barenboim presented a powerful case, without resorting to the idiocy of Nikolaus Harnoncourt’s suddenly discovered conception of them as a more-than-metaphorical wordless oratorio (! ), for musico-dramatic understanding of them as a triptych. Our greatest living conductor of Wagner and Beethoven is almost certainly our greatest living conductor of Mozart too. And what players he had here at his disposal, both individually and corporately! First, then, came the E-flat Symphony. The introduction to the first movement exuded warmth and grandeur, very much in the tradition of those greatest of Mozartians, Karl Böhm and Colin Davis. Barenboim and his players also shared those conductors’ understanding and communication of ease and tension. It was as fateful as any overture, even that to Don Giovanni. And how the richness of the orchestra, not least its post-Prague Symphony woodwind, matched, even enhanced the richness of Mozart’s harmonies. Dissonances pointed long into the future, even to Schoenberg, but here of course they were resolved, and how! Barenboim, who has now thoroughly internalised the influence of Furtwängler, slowed for the transition to the exposition proper, just as if he were outlining the dramatic necessity of an on-stage operatic manœuvre. The first subject came forth at a measured tempo, properly emerging from the nature and demands of the material, sounding as if it could not be otherwise. (Of course, it could have been, but that is not the point; necessity wears more than one face.) The second subject likewise emerged with what sounded like absolute necessity, necessity in all its dazzling, ever-developing variety. As in Berlin, Barenboim did not take the repeat here, though he would in the first movements of the other two symphonies. The development section, however, continued to develop at such a rate that one barely missed what we had ‘lost’; there was such conflict and also such civilisation – the two are closer than many would like to admit – in what we heard that such ‘loss’ in any case barely registered. The recapitulation was upon us in the twinkling of an eye, yet all had changed in the meantime; few conductors alive understand the dynamism of sonata form so well as Barenboim, still less communicate it so well. The late beauty of the West-Eastern Divan’s Harmoniemusik, as transition to the second group, brought Così-like tears, and for not entirely dissimilar reasons, to my eyes. It was, however, the Klemperer-like strength underpinning the movement and the symphony as whole that proved most important of all, the final climax the most thrilling I have ever heard, timpani rolls and all. The slow movement flowed unhurriedly, yet with dramatic, well-nigh operatic tension; there was something of Schubert too, to its tread. Until the minor-key episode, that is, when we experienced the ‘purest’ – yes, I know that word needs deconstructing – Mozartian tragedy. Everything was at stake, so it seemed; yet, with Shakespearean genius, all manner of alternative standpoints seemed both possible and necessary. The profusion of melodic and harmonic possibilities was quite wondrous, agonising even. Klemperer again sprang to mind, but with Böhm’s, or Bruno Walter’s, warmth. The minuet proved both aristocratic and boisterous, possessed of a longer line and characterful within that Wagnerian melos. It was, moreover, imbued with the most winning of old-world charm. (Sorry, puritan fundamentalists of ‘authenticity’!) The trio likewise combined the aristocratic and the rustic to generative effect, the WEDO woodwind section (and not just the woodwind) silky and fruity. Horns were simply to die for. Opera buffa and seria combined in the finale, its performance as integrative as anything in Barenboim’s Beethoven, yet retaining all of Mozart’s particularity. We heard, felt a better world; we heard, felt its distance from us. This was light-footed jubilation, yes, yet at the same time it was hard-won drama. Tragedy, Mozartian tragedy: such was the note struck from the very opening of the G minor Symphony. Once again, there was no need for anything to be underlined – let us recoil in horror from the freak-show tactics of the René Jacobs brigade – for everything grew out of the material and its possibilities. ‘Could your Beethoven have done that?’ I felt like asking. No, of course he could not, as he himself would have recognised, just as there were many things only Beethoven could have done. This was a reading closer on the surface to Böhm or to Klemperer than to Furtwängler, but line and – perhaps – meaning took one closer toward the greatest hero of all from Barenboim’s pantheon. The repeat seemed to be upon us almost before we had begun; such is Mozart’s concision and such was the tightness of this performance. The clarinets (in the second group) sounded as if they were played by angels. The jolt of development registered with all its might, which is to say again without exaggeration. Schoenbergian dissonance and the equally Schoenbergian task of reconstruction were accomplished with Webern-like concision. (We need to hear more Webern from Barenboim!) Woodwind led us, during the recapitulation, into still darker, deeper tragedy. Counterpoint – those who disclaim Bach’s influence here are surely in denial – wrought its horrendous magic. The turn to the tonic minor in the second group and coda brooked no alternative. Riveting, terrifying, and yes, edifying. Like its counterpart in the E-flat Symphony, the slow movement was not taken slowly, yet it was never harried in the now fashionable manner. Harmony and motivic development were permitted instead to do their work, free of interference from podium showboating. The variety of instrumental articulation was quite something in itself; more to the point, it was meaningful. The ghost of Bach once again seemed present: every note counted. The opening out, horizontal and vertical, of harmony brought the Wagner of Tristan and, again, Schoenberg, to mind. The Minuet was ferocious and yielding; every note seemed to have its own tone-quality, as if Barenboim were playing the piano rather than conducting an orchestra. It was at the beginning of the Trio that we heard a rare instance of string fallibility, but who cares? The rest was grace personified, or rather musicalised, and what balm we felt from the woodwind! It was developmental too, keenly so. The finale brought out Barenboim at his most overtly Furtwänglerian. Again, there was no routine note, let alone phrase. How tragically, even in the major mode, the second subject was shaped! The development was announced as a clear echo of its announcement in the first movement, the struggle but a stone’s throw from Beethoven. Dynamism and transformation were twin partners in the working out of the recapitulation. There was nothing pompous to the opening of the Jupiter Symphony: it was, rather vivid, dynamic, endless variegated, although again never for the mere sake of variegation. In C major it nevertheless emphatically rejoiced; we heard the world of earlier symphonies, piano concertos, masses evoked, transformed; shivers were duly sent down the spine. The first movement development had the purpose of Haydn, but the temperament of Mozartian opera buffa. Rarely can the recapitulation have sounded so inevitable. Barenboim’s pause before turning to the minor was perfectly judged, Goldilocks-like. One felt, as well as knew, the truth of Charles Rosen’s observation of oscillation between major and minor as one of the keys to understanding the ‘Classical style’. Perhaps the second group here might have smiled a little more, Walter-like, but I am simply being ungrateful. The slow movement felt physically different as well as sounding different, on account of muted first violins; I am not quite sure what it was about the WEDO violins’ playing here, but the sensation has rarely, if ever, registered so strongly with me, sounding both ‘old’ and ‘new’. It was, more important still, heard and played as if in a single breath, possessing all the emotional weight of a great aria, or indeed the slow movement of a piano concerto. Its gravity was that of Idomeneo or La clemenza di Tito – works which, sadly, Barenboim has never conducted. (There is time yet!) Yet the guiding musical thread proclaimed Mozart as one of the greatest of all symphonists. Again, there was not the slightest trace of pomposity to the Minuet. It had all the dash, all the grace of a Platonic form of Vienna’s Redoutensaal, all the conversational quality of a string quartet, all the chorus-like quality of the opera orchestra. In its all-encompassing quality, it seemed, somehow, like a ball-scene from Tolstoy. Balance and teeming development took us on our way to a duly courtly response in the Trio, followed by vehemence, and again something more demure. The opening phrase and response to the finale were playful and severe – and not only in turn. And so, the great agon was set in motion. There could be no doubt of this movement’s status as crowning glory, but there was a struggle to come: both close to and sublimely unconcerned with Beethoven. What swagger there was in the learning, what humanity in the tendresse! This was music of the spheres, music of Heaven and Hell; this was species counterpoint that could produce music of the elegance and depth of all three Da Ponte operas. We not only knew that, though; we heard it, experienced it. The recapitulation rejoiced as the greatest Roman Catholic mass setting before Beethoven, the Coda, prepared with the utmost, almost sacramental, mystery offered the greatest ecumenism, Bach reintegrated into our thoughts and experienced. One’s heart leapt, with Haydn’s, for joy. Mozart’s miracle of quintuple invertible counterpoint remained both ours and untouchable, without peer.